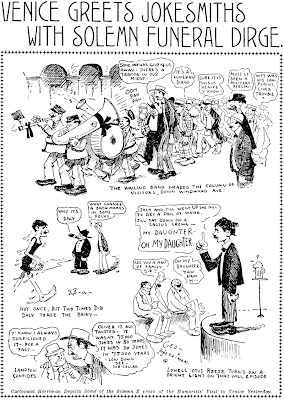 Friday, September 20 1907 -- The newspaper humorists converged on Venice for a get-together, and Herriman pens a cartoon filled with in-jokes. If they were explained, it was in the accompanying article that didn't make it onto my copy. 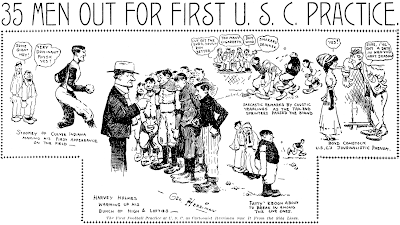 Friday, September 20 1907 -- football tryouts open at the University of Southern California, coach Harvey Holmes presiding. Only 35 candidates turned out looking for a spot on the team, of which 21 would be picked for the roster. Candidate Byron "Bull" Stookey was the subject of much comment because of his towering height -- "almost" 6' 5" -- quite the giant in those days. Here we have a recent obscurity, a delightful gag feature titled Meehan Streak by Kieran Meehan. Meehan is Scottish and made a name for himself over there in the 1980s and 90s with various features. In the 90s he invaded the colonies by contributing to King Features' 'edgy' panel cartoon series The New Breed. King Features editor Jay Kennedy was impressed with Meehan's work and encouraged him to come up with his own feature. 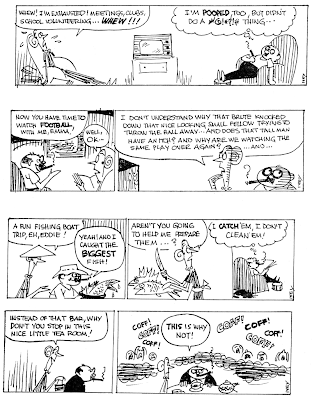 The result was Meehan Streak, a daily and Sunday gag strip with no continuing characters. Ultimately Kennedy ended up not taking the feature, and Meehan shopped it around. Meehan Streak ended up with a syndication contract at the Los Angeles Times Syndicate. The feature debuted sometime in 1999 (sorry, I have no exact start date) and ran until March 27 2005. Syndication moved to Tribune Media Services when the Trib and Times combined ownership in 2001. Although the strip was, in my opinion, a definite cut above the average, it suffered the almost inescapable fate of features that don't have a continuing cast of characters. As much as readers might have enjoyed the strip, there was no hook that would make them storm the battlements at a newspaper if it was dropped. Newspaper editors, therefore, tended to think of it as a disposable feature. When a syndicate salesman plopped the next 'instant classic' on the editor's desk, Meehan Streak was a prime target for cancellation. When Meehan Streak ended its run in 2005, Meehan bounced right back with a new feature titled A Lawyer, a Doctor and a Cop, this time for King. The feature is still in syndication but isn't taking the world by storm. The title was changed to Pros & Cons in 2008, but that doesn't seem to have led to any big jump in popularity. Donning my syndication guru turban again, I say the problem is the same -- lack of memorable characters. Pros & Cons is one of my favorite strips. I remember this strip. Toward the end he turned it into a strip about cavemen and changed the name to Tribal Meehan Streak. Didn't seem to improve the client list, alas. Meehan Streak is one of my all-time favorites. Was quite disappointed to see it end. The Chicago Tribune carried Meehan Streak as a replacement strip when a comic strip goes into reruns for a week or two or month in 2002-2003. Then the strip ran regularly from March 2004 (replacing the Hots) to August 2004 when it was replaced by Brewster Rockit: Space Guy. Originally from 1999 to 2003 it was focused for about 12 several plots/characters/scerios (including pirates, boxers, a pyscatrist,ancient Romans, and cavepeople), but from January 2004 until the end of the strip run in March 2005 it only focused on the cavepeople with rumors to rename the strip under the title of either Tribal or Tribal Meehan Streak as a last ditch effort for the strip, but I think failed to catch on. Bob Addams specialized in animals, sometimes of the barnyard variety, sometimes, as in The New Zoology, the fantastical variety. Addams was a fixture at Life magazine, but also occasionally did a short run newspaper feature. 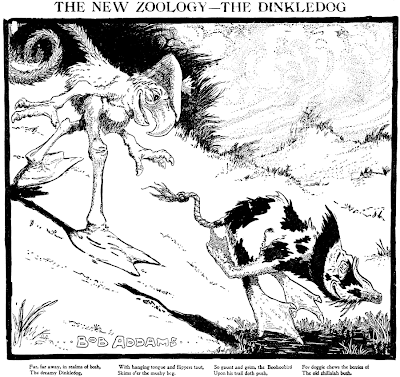 The New Zoology was done for the Philadelphia North American and ran just three times in their Sunday section, March 16 to March 30 1902. Although Bob Addams was a excellent and prolific cartoonist, I was surprised to find that there is no biographical information about him in the whole pile of the reference books I checked. Yes, the turtle has finally emerged from his shell, I'm back to regular duty on the blog. On Monday I sent all the final materials for the book to University of Michigan Press. The die is cast [shudder]. To add one final annoyance to the process, I wanted to use the last week or so to do one final pass on correcting questionable dates on Newspaperarchive.com. Naturally those folks decided to do "infrastructure upgrades" at the exact same time and the site was taking as much as 10-15 minutes to load pages. Sigh. Well, hopefully the upgrades will speed up that site. It's been ridiculously slow for months now. My next job is to start gathering the illustrations for the book, of which I've promised at least a thousand to the publisher. Quantity will be no problem as I probably have at least that many waiting around in my scan archives that go back nearly 15 years. Quality is, though, since some of the early scans are going to be needing upgrades. They were made back when storage space was precious and I often sacrificed resolution for small file sizes. Anyhow, enough about me, let's talk about Dr. Hardup. This was the first continuing feature that the prolific Charles W. Kahles penned for the Philadelphia North American. Unlike most cartoonists of the day who worked in one venue at a time, Kahles was also contributing material to the New York World and McClure Syndicate simultaneously. Even more surprisingly, he was signing the material at all three places. 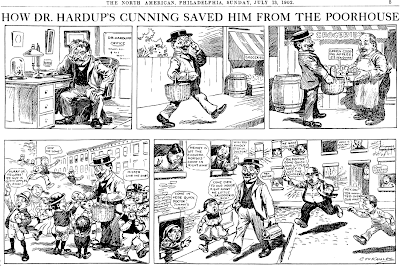 Usually when cartoonists worked for several different syndicates they would take on pseudonyms or just not sign at all. Perhaps Kahles' style was so immediately identifiable that there was no point in hiding. A better guess would be that Kahles' fine services were in such great demand that editors were glad to have him in their sections even if he was dividing his time. The plot of Dr. Hardup seems downright bizarre today -- a doctor who has to drum up business for himself? I guess we wouldn't be in our current health care mess if doctors were twiddling their fingers waiting for business! Dr. Hardup ran from July 13 to September 28 1902. The above scan, provided by Cole Johnson, is of the debut episode. Thanks for the info, which I will be looking over ASAP. I did wonder what my reaction would be to the first new piece of juicy data I received after submitting the final data for the book. Turned out that it was nothing dramatic (no frothing at the mouth, no fetal position sobbing). Guess I'm too worn out now to get all that bent out of shape about it. Have a cigar for me buddy. I respect your skills as a cartoonist and your wisdom as a tobacco connoisseur. I am now following you on Blogger. I appreciate your constructive criticism on my productions as well. Sir, Thanks for the cigars.